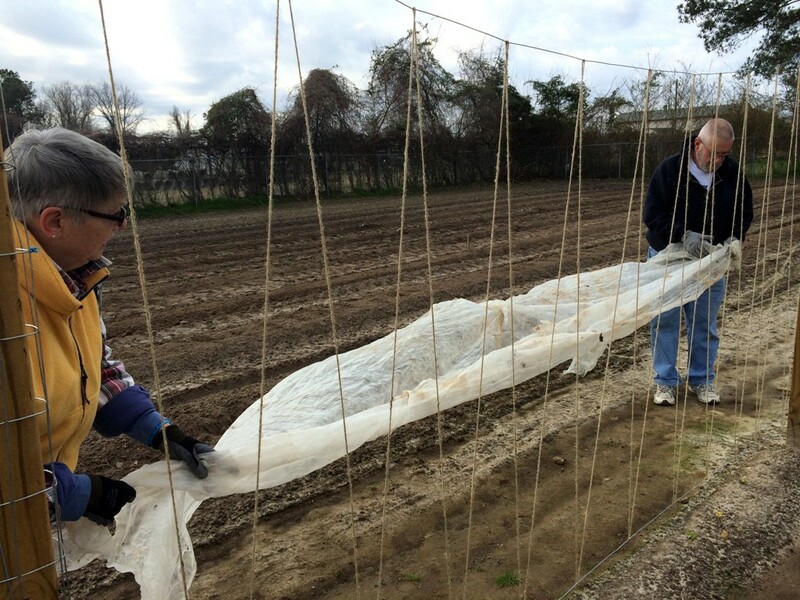 This week they finished planting a row of broccoli, put up trellis to grow cucumbers, and covered bean sprouts with a special cloth to protect them from the possible freeze this weekend. 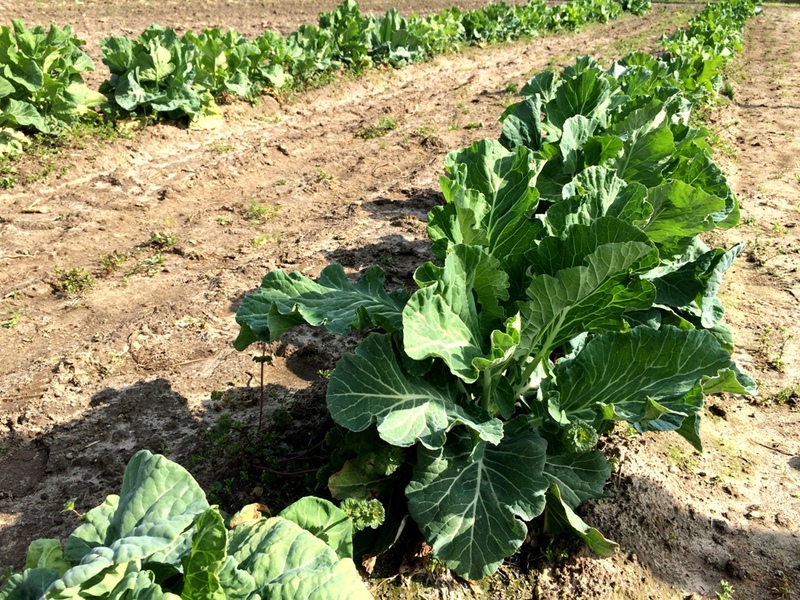 Next week they will harvest the rest of the collard greens. 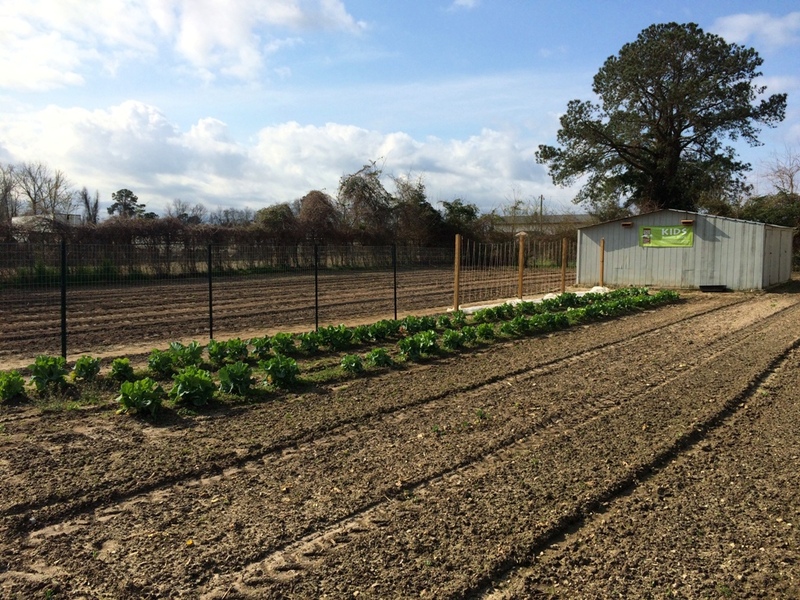 Our New Bern Branch’s garden with collards ready for harvest. Our New Bern Branch is the only of our distribution centers with a garden–the only one able to provide fresh produce grown right there on the premises to the local community. The half-acre of land and hard work of volunteers provided 7,500 pounds of fresh fruits and vegetables last year, over 12,000 pounds total since it opened in 2010. Collards ready to be picked and distributed at our New Bern garden. Our New Bern Branch operates with a staff of two and a handful of dedicated volunteers out of a 6,200 square-foot building. The smallest of our distribution centers, the branch faces unique challenges related to limitations on staff capabilities, available resources, and a service area with many rural communities. 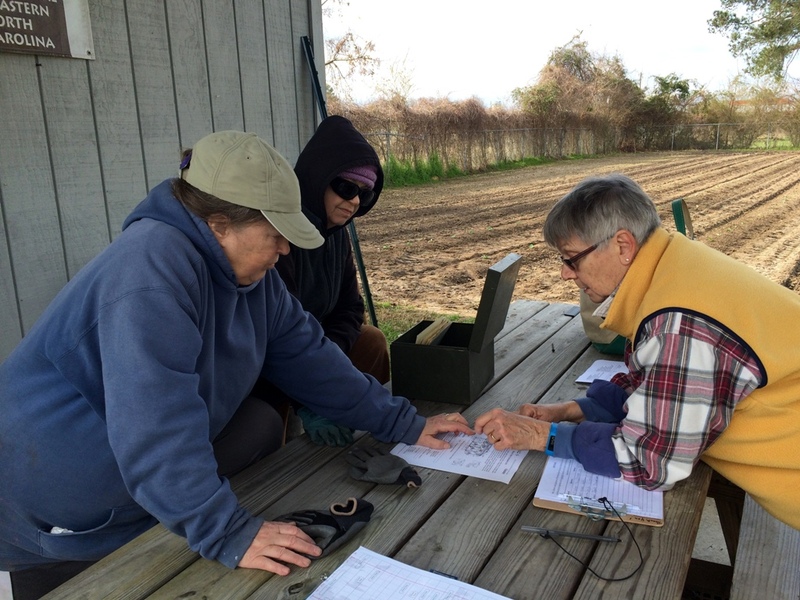 As we continue to face these challenges, the garden serves as a continuous source of fresh food for more than 62,780 individuals living with food insecurity in the New Bern service area. 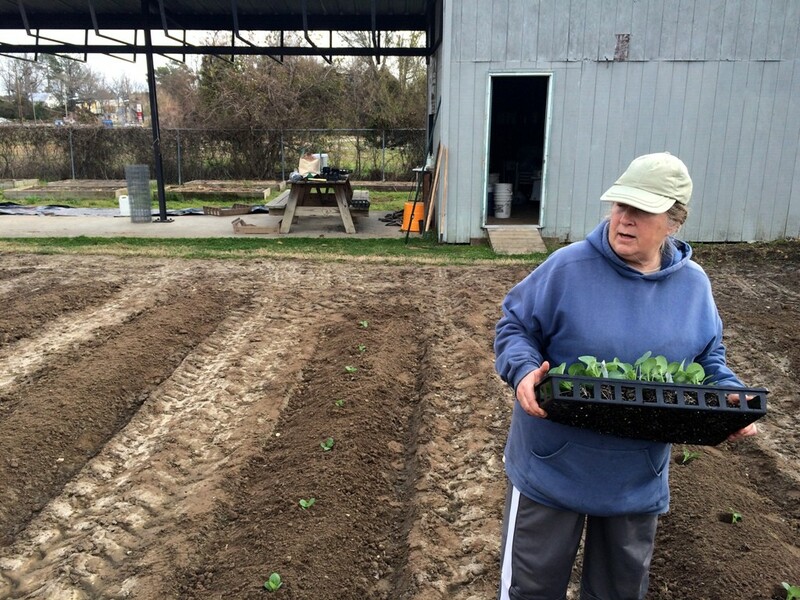 It provides locally grown, fresh produce to our most vulnerable neighbors and provides an outlet for the volunteers to practice what they love: gardening and helping others. Volunteers cover the bean sprouts with a cloth to keep them warm this weekend. After the morning’s work, the volunteers gather around their work bench. They talk strategy and weather forecasts, weighing the options for types of crops they could plant next month. Tomatoes, squash, and cucumbers receive a consensus, but they debate on how to best use the remaining space. They also look at plans to build a compost bin and the merits of various designs they could construct. Then they move on to the rest of the summer planting season, gesturing toward the future rows of corn and plans to plant flowers along the fence. They speak quickly and excitedly. They know how much work it takes to help a garden of this size flourish, but they quite simply enjoy it. Volunteers gather around their work bench, which incidentally was also built by a volunteer. For these volunteers, the hard physical labor is not a deterrent, and doing it all for free is not even a question. They manage and grow the Food Bank garden because they know that’s how they can help people at risk of hunger in their own community. And at the Food Bank, we know that sometimes all you need is a small group of good hearts and a little sunshine to make a big difference. 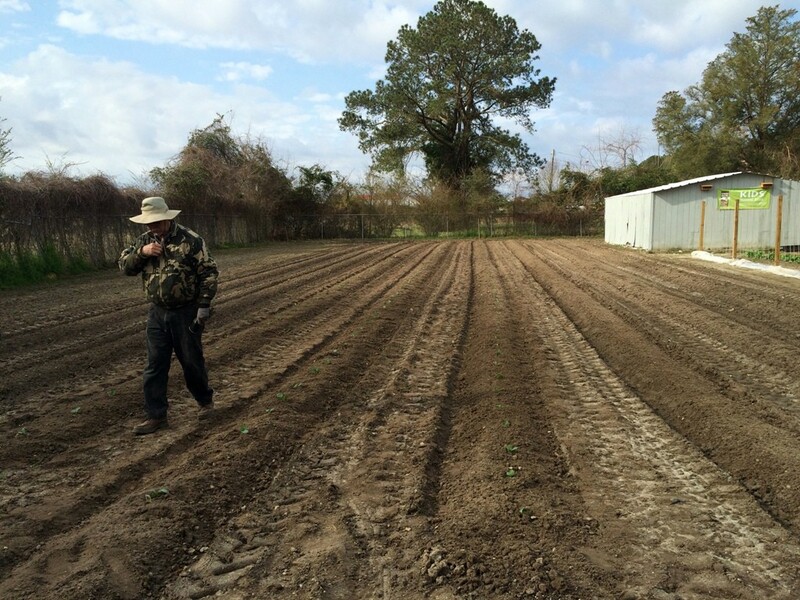 Another lead volunteer, John Krofchick, walks the field while planning the year’s crop rotation. To learn more or to donate to our New Bern Branch, please visit our website. If you’d like to volunteer in our garden, please call the branch to sign up: 252-514-2006. I am also writing a blog on hunger in my surrounding county- areas in Tennessee. I find that it is very important to show people what is being done and what can be done to help this issue. Community hunger is something I feel many people over look, but blogs like these are benefitting the community to bring awareness. Knowing that many people can read and find out information on this problem is a tremendous advantage on getting the word out. If anyone would like to find out information and see what they can do in Tennessee, my blog is http://helpendhunger.cnvolved.org. Thank you for your service and community passion for helping others.